With its sizeable arsenal of tempo-synced effects, Artillery 2 will have you armed to the teeth for your next live performance. Although there are better plug-ins available for straight-up effects processing, the novel concept of Artillery 2 makes it both fun and inspiring, and great for live work. Fantastically simple and intuitive interface. Unique concept. Tempo-synced modulation per parameter. Results can seem ‘samey’. Difficult to push effects to extreme settings. Only one mod source per parameter. Artillery 2 is something unique: an 'effects keyboard'. 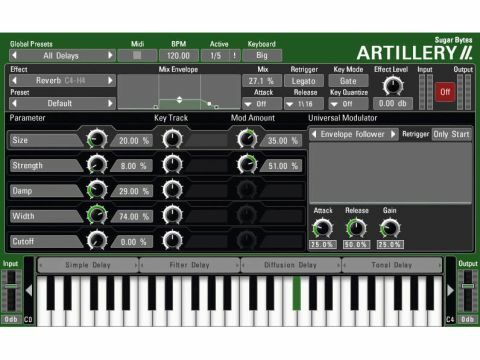 Comprising a fairly extensive collection of processors, ranging from bog-standard filters and delays to advanced granular processing and even a vocoder, Artillery 2 sets itself apart from other effects plug-ins by enabling you to trigger its various effects via fully configurable zones on your MIDI controller. What's more, parameters can also be modified by tempo-synced modulators, including an envelope follower, LFO and ADSR. Sugar Bytes should be commended for Artillery 2's interface, the functions of which are almost patronisingly obvious. Effect zones are set up by drawing boxes across ranges of keys on the on-screen keyboard (these correspond to those on your MIDI controller) and the effect occupying each zone is selected from a dual-function drop-down list or tabbed menu. Once you've selected an effect, its parameters immediately appear in the centre-left of the interface, with the tempo-synced modulators on the right. Each effect parameter can have its own modulation source and be mapped to an external controller via the right-click MIDI learn function. An animated green ring around each parameter knob shows the strength of the modulation as it takes place, so you can, for example, see the ring pulsing in time to an assigned LFO. Similarly visual is the keytracking option, which causes a parameter to be modulated according to the pitch of the played note. As this setting is tweaked, a series of bars indicating the relative modulation levels for the relevant keys is displayed. While Artillery 2 offers a vast range of modulation possibilities, a global matrix that enables multiple sources to be sent to destinations of your choosing, and thus giving a full overview of all modulations, would be a great addition for a future version. Once you've configured your effects, playing them is as easy as routing a MIDI track in your host of choice to Artillery 2 and hammering away on the ivories, or indeed, your choice of MIDI controller. You can also control the triggering behaviour for each effect with synth-like options such as legato and gate, and also quantise the onset of the effect to tempo-synced beat and bar divisions. Additionally, an envelope controls the fade in/out of the effected signal and the mix between it and the dry signal. Artillery 2's array of included effects is very broad, but the range of sounds each can produce feels slightly limited. Even with extensive modulation taking place, and the various parameters of a single effect set to their most extreme, the results seem slightly predictable at times. Still, the ability to stack effects by depressing multiple keys can provide some surprising results. While it's not likely to have you tossing out your go-to plug-ins anytime soon, if you're looking to bolster your live rig, Artillery 2 might just provide the additional firepower that you need.